Adult Learning strives to provide meaningful Jewish learning and a variety of enriching experiences that help to develop bonds and connections for the adult members of Temple B’nai Or. 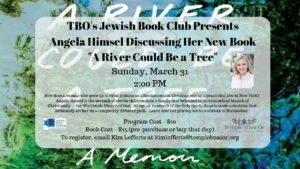 Sunday, March 31 at 2:00 PM, the Jewish Book Club welcomes Angela Himsel, who will share with us her book A River Could be a Tree. For more information on Ms. Himsel and the book, please click here. Cost for the program is $10 (for refreshments). The book can be purchased at the event or prior, in the Temple office for $15. For more information, please contact Carol Marin at carolmarin76@gmail.com. RSVP to Kim Lefferts at kimlefferts@templebnaior.org. Men’s Schmooze meets on the dates below with Rabbi Katz. Bagels and desserts are served. Each meeting has topics relevant to Jewish life and what is happening in the world. RSVP to Stuart Rayvid at srayvid@aol.com. Meet on Saturday mornings with Rabbi Katz on the dates below. Bagels and coffee served. Each meeting will discuss the Torah portion for the week. Rabbi Katz will guide a discussion group which will analyze the writings of great Jewish thinkers.